ECSU Honors Program students who attended the National Association of African American Honors Programs Conference were, left to right, Brenna Daniel Eyricka Johnson, Rachel Lowe, Mattelyn Bond, and Jasmine Roundtree. Rear l-r: Kyra Purvis and Arrhia Palmer. Not pictured are student Nyla Harris, Dr. Melissa Stuckey, and Dr. Kenneth E. Jones. 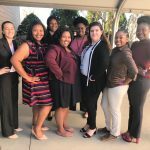 Elizabeth City State University Honors Program students were some of this year’s top National Association of African American Honors Programs (NAAAHP) Conference participants. 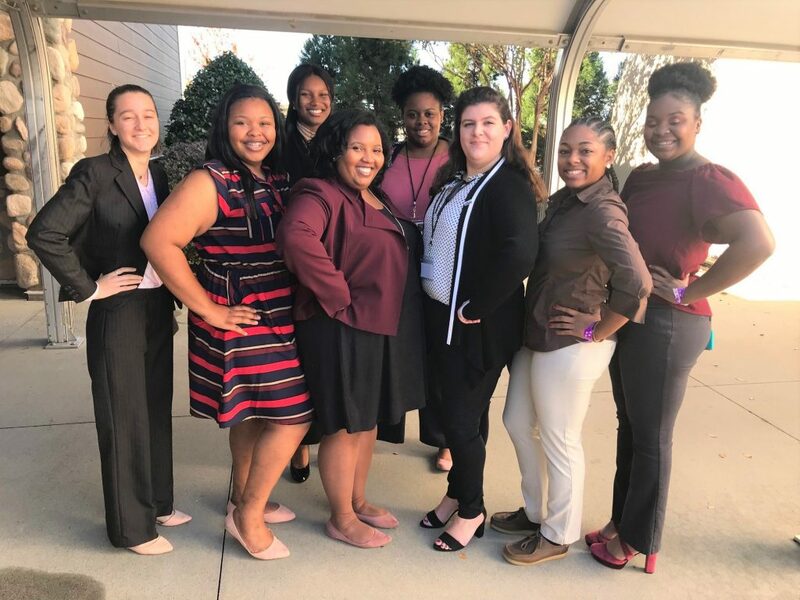 Held in Concord, North Carolina, and hosted by Livingstone College, on Nov. 14 through Nov. 17, nearly 300 scholars representing 25 historically black colleges and universities from throughout the nation attended the event. Highlights of the conference were competitions such as a quiz bowl tournament, debate, Model African Union, and research and poster presentations. Graduate and professional schools and businesses offering internship opportunities were on site for a career fair. Professional development for program directors and honors faculty was also available. In the competitions, sophomore Kyra Purvis won first place in the oratorical contest, with the title, “No Matter how dark the night, I believe in the coming of the morning: An interpretation of Dr. Joseph Charles Price.” Purvis received a certificate and a monetary gift. The quiz bowl tournament was extremely competitive as 14 teams vied for the championship. Top national quiz bowl teams such as Spelman College, Jackson State University, Tuskegee University, and Morehouse College were among the field of participants. ECSU competed aggressively and was initially declared one of the four semi-finalists for the playoffs. But in a controversial ruling, Jackson State University bumped ECSU for the fourth spot. The Tuskegee team won the quiz bowl championship. Members of the ECSU quiz bowl team were sophomores Arrhia Palmer, Jasmine Roundtree, Jasmine Brumsey, and junior Brenna Daniel. ECSU’s debate team also was competitive, receiving Best Affirmative Research for the second time in three years at the conference. ECSU debaters were seniors Mattelyn Bond and Rachel Lowe and sophomore Nyla Harris. In addition to the formal competitions, senior Eyricka Johnson competed for Miss NAAAHP. University Honors Program Director Dr. Kenneth Elvis Jones was elected national vice president of NAAAHP. Joining Dr. Jones at the conference as honors program associate and faculty representative was Dr. Melissa Stuckey, Asst. Professor of History.